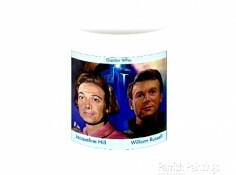 Rock Stars, Pop Stars, Film Stars, Sporting Stars, Comedians and TV Programmes. Kevin is a fan of so many. Here are just a few people who have shaped and have had an influence in his life. This is the story so far, but there are many more he admires that have yet to hit the canvas. 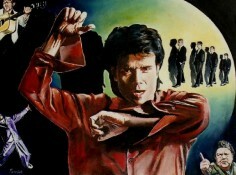 The Summer Holiday film was the first time Kevin noticed Cliff Richard and realised how good a singer he was. The Shadows single 'Apache' certainly made an impression on him in the 1960s with its distinctive guitar sound. Kevin loves the universal humour, emotion and innocence of the Norman Wisdom films made in the 1950s and 1960s. Norman was part of his childhood along with stand up comedian Ken Dodd, who certainly has a unique style of humour. Surely two of the funniest British comedians ever. 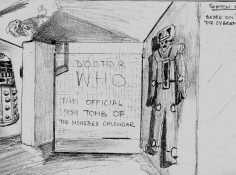 Slow Dazzle Calendars in 1999 commissioned me, the Artist, to come up with some ideas based on former Doctor Who stories which would come under consideration for inclusion in a Monster Calendar. 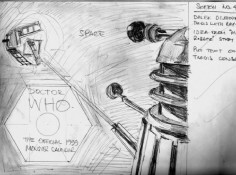 Kevin has been an avid watcher of the TV programme Doctor Who (an adventure in space and time) from its opening episode first shown in November 1963. 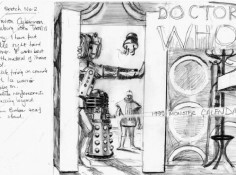 He also enjoyed watching the two Dalek films, first shown at cinema's in 1965 and 1966 around the UK. 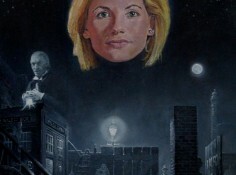 He has felt inspired to create many Doctor Who related images over the years in oil paints, after watching the Doctor's adventures and this page is his tribute to the great legendary TV programme. Kevin first heard Earthsong on Top of The Pops one Thursday evening on the BBCTV. One of his most favourite songs ever. Very moving and powerfully executed by Michael. He started to explore and enjoy more of his music as time went by. Surely he was the "King Of Pop"
Kevin remembers first hearing Elvis Presley's songs during his childhood days (the 1960s) on Children's Favourites on a Saturday morning, which was broadcast on the Light programme, now BBC Radio 2. Songs were played by Children's request. He has watched Elvis' films/movies too. He became aware of John Wayne films/movies through his Father, who was a 'Duke' fan and favourite film was 'She Wore a Yellow Ribbon' Surely two of America's greatest Icons. When Kevin think of pop music, he always thinks of the Beatles from his childhood in the 1960s. 'She Loves You' was his first single 45rpm and it had endless playings on his Father's Hifi in the mid 1960s. Their songs were very good catchy tunes and seemed to be ubiquitous at the time and still are today.